Basement professionals run the gamut of home improvement contractors. 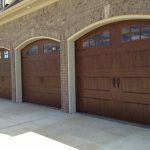 You can find a company that offers comprehensive finishing services. Or you can find a handful of pros to complete the project piecemeal, starting with a waterproofing company and then plumbing, electrical, and flooring experts. You need to know how to find the right contractor, what to ask them, and how you can work with them. This guide can help whether you’re looking to finish your basement or simply need to add waterproofing. Where Can I Find Basement Contractors Near Me? Often the least expensive option to add livable square footage to your home’s floor plan, basement finishing is a can’t-miss proposition. But it can only work well if you take your time in finding and interviewing professionals. Finishing your basement is a large investment in time and money. The rewards can be even more significant. When hiring the right expert, you will add a significant amount of living space while also adding about 70% of the project cost in value to your home. You may need to hire subcontractors to handle electricity, plumbing or waterproofing. Ask your contractor if they specialized in these services in advance. Looking for a basement finishing pro? Some contractors provide you with basement flooring choices and evaluate the pros and cons with you. Others will simply expect you to make all the design and material choices. Know what to expect before hiring an expert. Set your budget. Finishing your basement costs between $10,000 and $50,000 and even higher, so knowing what you can afford is crucial. Go beyond price. Take the extra time to look over photos of each company’s previous work to avoid choosing a low-quality professional. Look for online reviews and ratings, especially on independent sites like HomeAdvisor. Check license and insurance information. Pay attention to communication. This is a large and often lengthy project. Make sure the company you choose will respect your wishes. What’s your experience with basement finishes? Were you formally trained, or did you learn through an apprenticeship? Are you licensed, insured, and registered with the state? 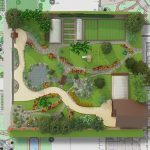 Will this project require a permit, and can you help me obtain it? How long do you estimate the project will take? Will you provide cost options for different materials? Which part of the project will you complete, and which will need subcontracted? Will you manage and oversee the subcontractors on the job? Do you have any references of previous work that I can contact? Following that last question, contact references for any company that still matches your criteria. Knowing what questions to ask each past customer can help you discern the quality of work. Were you happy with the project? Was the job completed on time? Were there any unexpected expenses? Would you recommend this professional? Need a Basement Finishing Contractor? Your basement might already be finished but needs a thorough renovation job. In that case, it pays to work with an expert that specializes in remodeling. That pro will work as your general contractor, and subcontract specialized tasks like waterproofing, electrical, and plumbing. 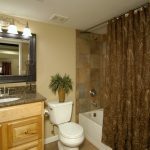 Unless you plan to change the layout of the space, these tasks will not be as significant as they are for basement finishing. Set a price range. With an average cost to remodel a basement at about $20,000, knowing what you can afford should be your first step. Start with broad research. Write down a list of contractors in your area that can potentially do the job. Pay attention to customer opinions. Online reviews and ratings are a great way to narrow your search. Check license and insurance. Only consider experts who have the necessary paperwork in place. Use your judgment. 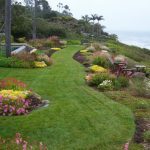 Given how lengthy the project can be, you must be able to get along with the workers on your property. How long have you been remodeling basements? What formal education did you go through for this work? Do you have a state-issued license and registration? Do you give written warranties? Can you estimate how long this will take? Once you have references of previous customers. Ask them several questions to get a sense for their experience with the pro. Not all renovation projects are aesthetic. Some are necessary just to keep your home dry. A basement waterproofing company can ensure that is the case through a variety of solutions that may range from the installation of interior sump pumps to exterior French drains. These pros tend to be very different from those finishing or remodeling the space. Some companies offer all services but most specialize in one or the other. Some of this work will occur directly at your foundation, so finding an expert with the proper expertise is essential. Reputation is key with this type of professional. Any work that may involve your foundation will need someone who knows exactly what they’re doing. The cost to seal your basement can run you $10,000 or more. Make sure that money is spent wisely. Know your problem. It might just be a $500 fix, or you might need a new foundation. When in doubt, ask for free foundation repair estimates. Do your research. How many professionals in your area can provide the work you need to keep your space safe and dry? Check ratings and reviews. High ratings are great. In-depth reviews that detail the job done for a customer are even better. Check licensing. Don’t work with anyone who isn’t licensed and registered with the state. Understand warranties. Consider only companies that back up their talk of quality with a guarantee that they can fix any issues. The interview process is crucial. As you bring companies out to give you a quote, sit them down for a few very specific questions to help you determine their quality. What is your estimated timeframe for the job? Have you had any failures of systems you’ve installed? What went wrong, and how will you fix it this time? Would you recommend interior or exterior waterproofing, and why? What sump pumps would you recommend, if any? Where would you put it? 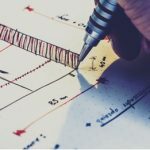 Why do you think your proposed project would be the right solution for me? Do you offer a warranty, and what does it cover? Can you provide any references of past work like mine? Answers to these questions will tell you (almost) everything you need to know. Look for honest answers that might acknowledge past failure, but also a way forward to ensure it doesn’t happen again. Experience shines through in some of the more detailed questions, even if you’re not a waterproofing expert yourself. The first question most homeowners must answer is whether they need to hire an external pro. In most cases, the answer is yes. If you are an expert on any of the below, you might be able to save some money by doing it yourself. Can I Finish My Own Basement? You can finish your own basement, but only if you have extensive knowledge in plumbing, electrical, HVAC systems, and general contracting. Start by contacting your local municipality to understands any necessary permitting. Be prepared to uncover potential issues once you begin to work on the walls and floors. The project will take time, too. When working only during weekends, it’s common for this type of project to last two years or more. Can I Frame My Own Basement? Do you know how to install a floating wall? The answer to that question is central to understanding whether you can frame your own basement. Simply putting down a few 2x4s is not enough. The soil under your foundation, and with it your cement flooring, will expand and contract over time. Floating walls ensure that this movement does not seriously affect the integrity of your home’s structure. That’s why working with a professional is important. The finishing layer above your wall frame will have to account for floating walls. Whether you want to put in drywall or wood paneling, you must make sure that you leave enough space for an expanding and contracting floor. It requires knowing exactly how much space to leave to the floor, and how to anchor the wall. Most homeowners are not familiar with that process, which is why it’s best left to licensed contractors. Installing your own basement flooring is similar to other levels of the house, with a few additional complications. Moisture: You must keep your flooring dry in a space with potentially high moisture levels. Obstacles: You need to protect the integrity of your interior French drain or other types of existing waterproofing. If you’re not sure about either, hire a professional for help. On the level below your living space, ceilings take on extra importance. They finish off the space, but also need to retain easy access to all plumbing and electricity that flows into the home. That’s what makes drop ceilings so popular. 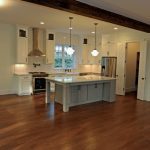 You need to know exactly how much space to leave, how to support all your ceiling beams, and how to avoid electric wires. Work with a contractor who can help. Looking for a basement contractor? 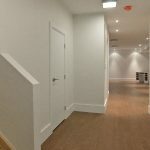 What Can I Expect From My Basement Finishing Company? What you can expect from your finishing company depends on the exact pros you’re hiring. Some will sit down to plan out the detailed floor plan and material choices with you. Others will expect you to make those decisions. Regardless, your hired company will expect you to have the space cleaned up and free of both debris and clutter. Make their work as simple as possible by providing them easy access to and from the basement. If the contractors will be particularly dusty, as in after sanding drywall, buy some carpet pieces from a local store and lay them in a path to the door. 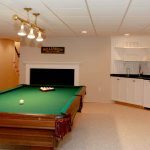 Are Basement Finishing and Remodeling Professionals the Same? Many, but not all basement finishing and remodeling professionals are the same or offer similar services. Finishers tend to do remodeling as well, but remodelers can’t always finish a space. That’s because the process tends to be more complex and involves more subtasks. Make sure you’re clear what you’re looking for when hiring one or the other to avoid confusion. Is it Worth it To Finish a Basement? 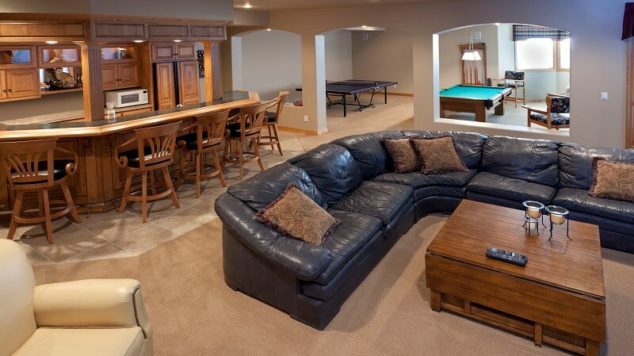 Finishing your basement is worth it, both for resale value and the additional living space. It’s the easiest way to add livable rooms to your home without building an addition. The average project puts about 70% of your finishing costs back into the home’s value. How Should I Deal With Basement Contractors on My Property? 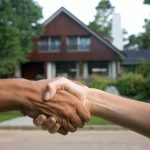 Proper etiquette can make everyone’s job easier during a large home improvement project. These contractors are going to spend most of their time well out of your way. This is very convenient for all involved, but it is extremely important to keep the lines of communication open throughout your project. Brewing a big pot of coffee and offering your crew a cup is one of the best things a homeowner entering a major remodel can do. It won’t cost you much, but it will let your crew know you appreciate the job they are doing. Homeowners who show their contractors a little warmth are often paid back ten-fold in productivity or even little extras at no charge. How Can I Get a Cheap Basement Remodel? Get multiple quotes to make sure you’re getting reasonable prices from all companies. If you’re qualified, consider doing some of the work yourself. Organize experts like electricians or plumbers, rather than letting the general contractor handle it for a charge. Choose your materials wisely, like vinyl over ceramic tiles. In any area of the country where most homes have a basement, finishing pros are easy to find. You also must make sure that you work with quality experts. HomeAdvisor allows previous clients to post ratings, comments, and reviews of the company they chose. Check out basement contractors near you to get the process started.